Welll Spring has sprung and being in the garden in the sunshine is my favourite thing! 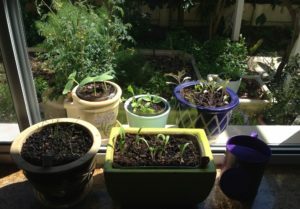 Knowing my veggies are pesticide free makes gardening even more joyful. So today I thought I’d share some tips to growing (more of) your own pesticide free, delicious fruit and vegies this spring and summer. Have you ever thought about having a worm farm/compost bin? it’s lots of fun and so good for the kids to help with (what kid doesn’t like wriggly worms?). Sudies show most kids (we all) need to spend more time in nature and get their hands dirty to improve gut microbiome and strengthen the immune system. It’s so easy, all you need is a small closable kitchen bin for your scraps (I have one under the sink but you can just have a simple small bucket with lid). Keep a pitchfork handy and rotate the mixture every day or two to aerate (I find this very therapeutic!). Keep the mixture moist but not wet or the little ones will drown and the mixture will become rotten and smelly. You can buy compost worms but honestly good old fashion garden worms are great. 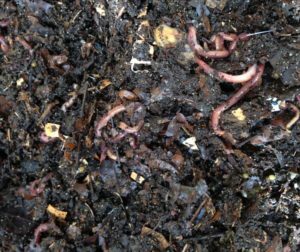 As the compost bin is open at the bottom the worms will find your goodies and start gobbling the scraps, leaving their prized worm castings (poo) in replace. 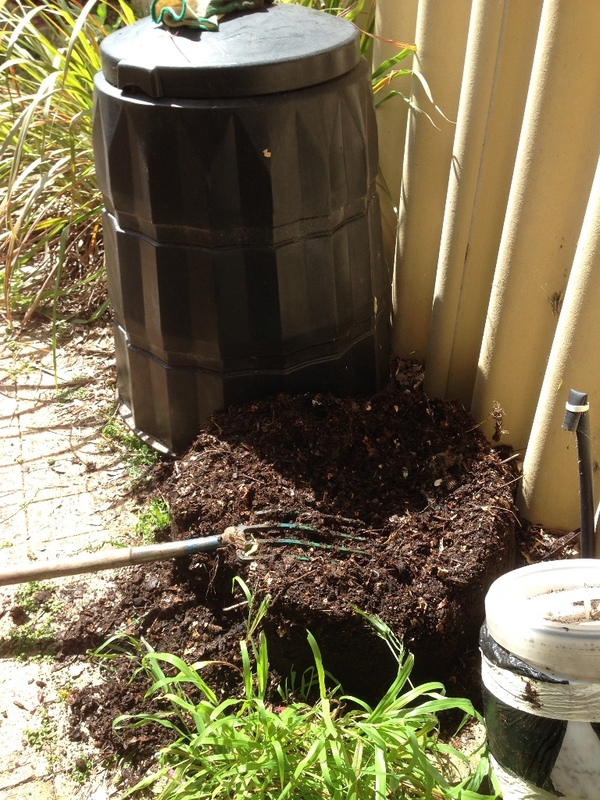 When I just can’t wait any longer to use the glorious newly enriched soil, I start putting the scraps into a little temporary bin. After a few weeks the worms have gobbled up pretty much everything and the mixture is ready. I carefully lift off the bin to leave a lovely neat mound of goodness. The worms will hide from the sun so I carefully lift off the top layer with the pitchfork each day and dig it into the vegie garden, bringing along a few hitchhikers to nourish and aerate the garden soil.Easy as that! Do you love Blueberries? They are one of the best fruits you can eat, low GI, full of fibre, potassium, folate, vitamin C, vitamin B6, and phytonutrients. But they are just soooo expensive! 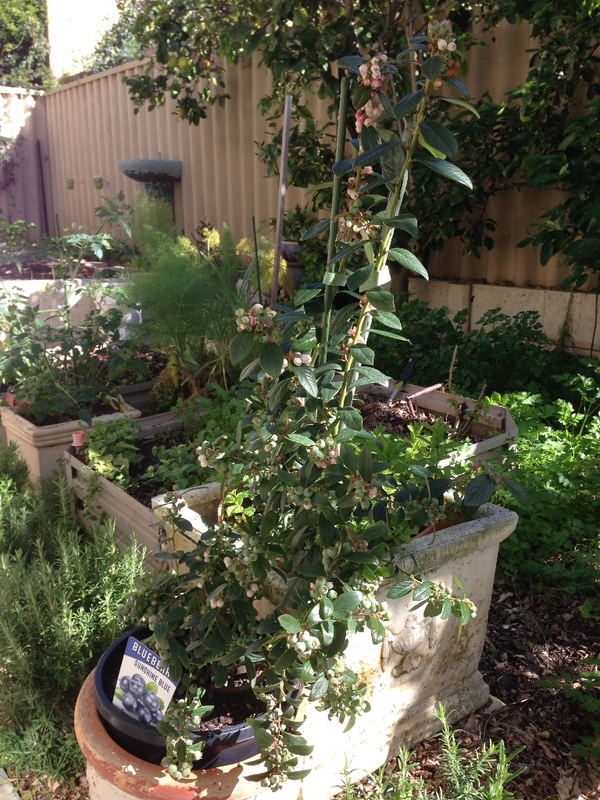 Who knew they were so easy to grow in Perth!! I got this beauty for $30 at Bunnings and it is chock full of berries (I’d be lucky to get 6 tiny punnets for this money) … yum!!!! … and home grown means you can chose what chemicals go on them. Have you tried asparagus? It’s easy peasy and so much fun watching them come out of the ground. 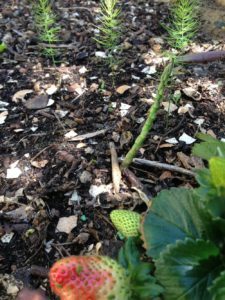 DYK strawberries are #1 on US dirty dozen list? 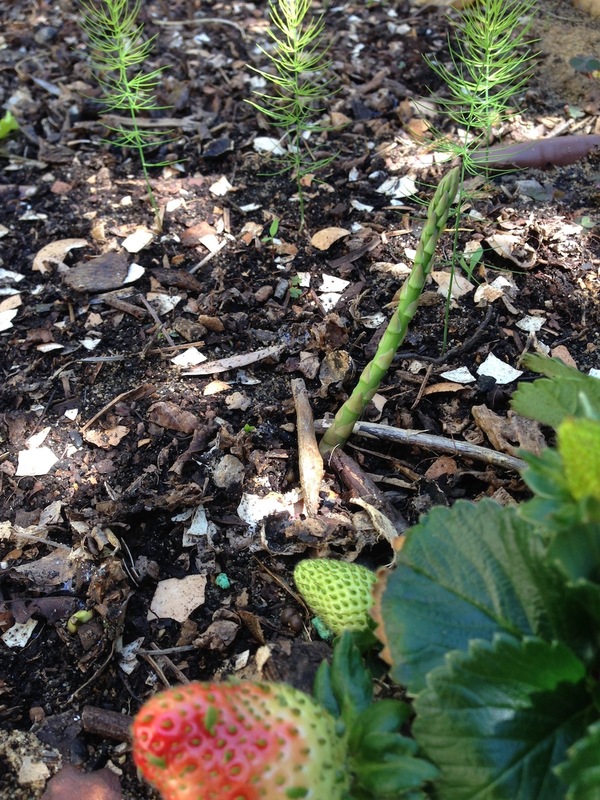 Choice also confirmed Australian strawberries were high in pesticides… so easy to grow and taste so much better! Do you have a North facing window? August and Sep can be too cold and dreary to venture out or for seeds to sprout well so I make use of my kitchen bench, it’s the warmest place in the house and is drenched with early spring sun. Once they’re big enough a pop on outside window sill to toughen and vioila, my babies are ready for the big bed! 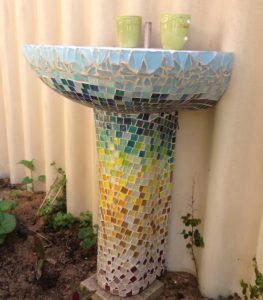 Want to save a little water? 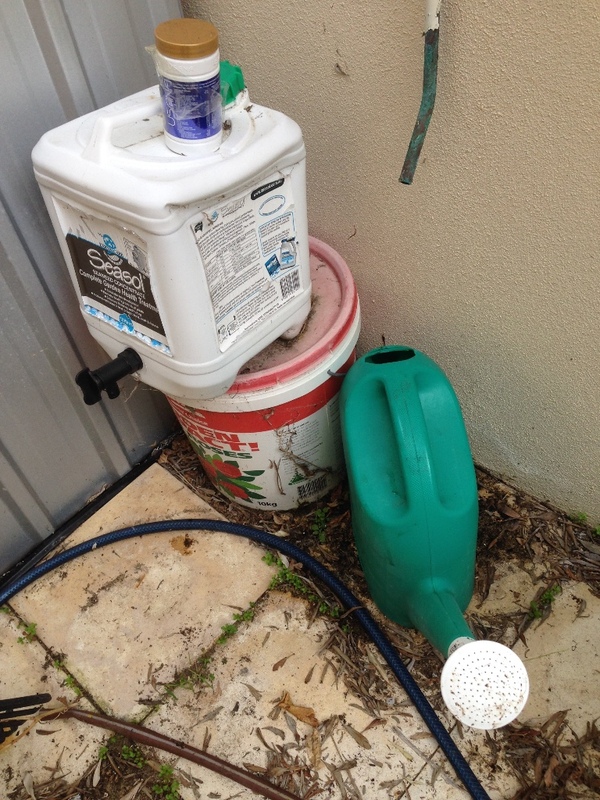 Pop the watering can under the hot water run off or air con run off. Have a bottle of seasol ha ndy to add straight in for an extra nourishing lift for your vegies. Birds not only sound lovely in the garden but they are great for bug catching! 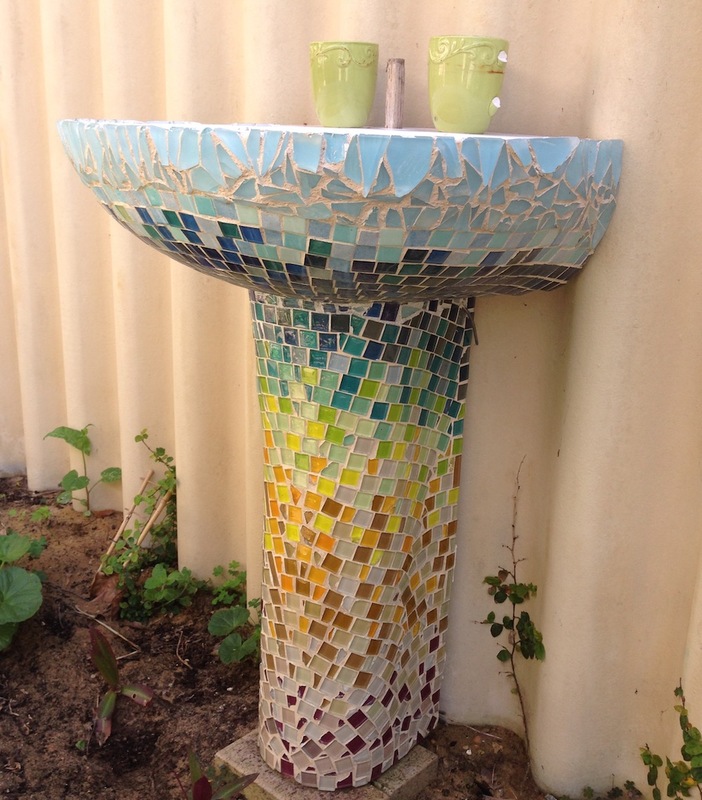 I mosaiced an extra basin I have been lugging around for years, I am hoping the birds will love it for a bird bath. Do you have any good tips for gardening? I’d love to hear!